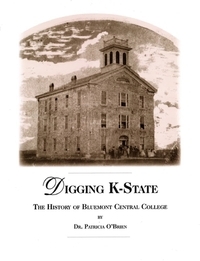 The latest book by Pat O'Brien, author of The Architects & Buildings of Manhattan, KS describes archaeological digs of Bluemont Hall, the original building of Kansas State University and the Goodnow Barn at the home of Isaac Goodnow, a founder of the college and the town. This is the story of how Bluemont College became the land grant university of Kansas,with biographies of many of the people involved. Paperback. Hardcover edition is available for $44.95.